As the local expert in transportation, one of Brush Hill Tours’ specialties is in providing shuttle services. We will coordinate pick-ups for all sized groups and shuttle you to and from your destination point. 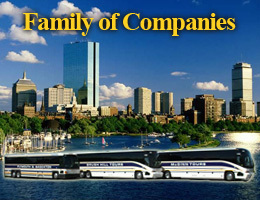 Our transportation services are perfect for corporate, academic or special events, including weddings, proms or reunions. We provide on-site dispatchers and coordinators when needed to ensure a stress-free event. The safety and comfort of your group is our utmost priority.